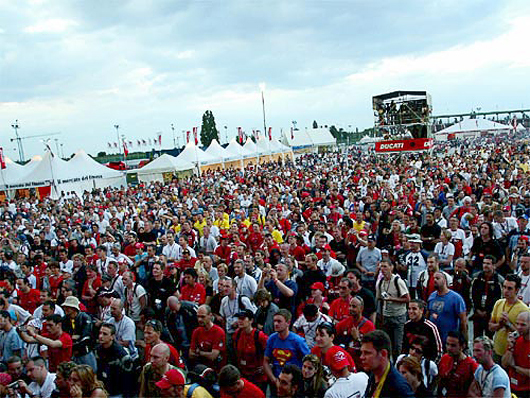 Misano, Italy, May 17-24th 2004 -Saturday at WDW2004: the biggest, most thrilling day of them all here in Misano. Tens of thousands of fans have transformed the famous Santamonica circuit into a sea of Ducatis. And of course, it's another perfect sunny day in Italy. 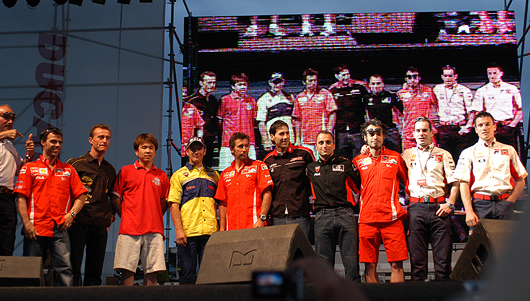 Ducati had most its top riders in World Superbike and MotoGP on stage saturday night, including the top private teams. From left to right: Loris Capirossi. Frankie Chile, Noriyuki Haga, Steve Martin, Troy Bayliss, Ruben Xaus, 3 team managers and James Toseland. Neil Hodgsen was at home healing broken ribs from his MotoGP crash at Lemans. all the riders were availalbe to the fans throughout the week at autograh sessions, racing seminars, and at pit walk throughs. At the Ducati Garage Challenge Tent, Loris Capirossi and Troy Bayliss were mobbed by hundreds of Custom-loving enthusiasts when they made the rounds of the Ducati Specials. Both MotoGP champions served on the Expert Jury and both racers were particularly impressed by the same bike. Troy said he chose the bike because it "represented the soul of a Ducati" while Loris selected the bike because it "had the clean and effortless beauty" he associates with the Italian brand. The winner was given a front fairing signed by Loris Capirossi, and the ever-gentlemanly Italian and Australian champions politely offered each other the opportunity to present the winner with the fairing until Troy finally said, "Well, it is your fairing Loris. Maybe you should be the one to give it away." Later, the Ducati.com staff awarded the specials that received the most votes from the public with "desmodromic" trophies created just for the occassion. 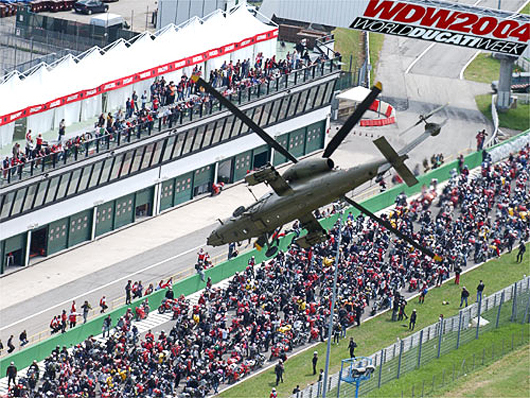 The Italian army Mangusta attack helicopter swooped up and down the track, as swarms of fans cheered above, and Superbikes roared on the track below. The afternoon saw the Ducati Auction of splendid pieces like Troy and Loris's signed scratched MotoGP tail pieces, with all proceeds going to Riders for Health and Clinica Mobile. 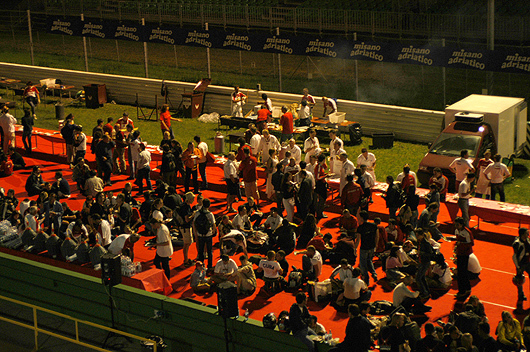 Ducati Corporate management including CEO Carlo Biaggi (below, 2nd from left kneeling) served dinner to all the participants on Saturday night a red carpet laid down the front straight across the start / finish line at Missano. When was the last time you ever meet anyone from a Japanese motorcyle company, let alone having them throw a huge party and dinner for youin appreciation for riding their bike? The evening hosts some of the event's most spectacular events, from the stunning announcement by Ducati President and CEO Federico Minoli, who finally let tens of thousands of fans in on Ducati's mega-secret project - click here for more on Ducati's shock announcement - to an overflight by the famed Stormo squadron in their F104 jet fighter, a massive BBQ, Italian style, where all the enthusiasts were served delicious grilled fish by top Ducati management, fireworks and a live concert by Italian singing sensation Irene Grandi. And much, much more. Italian pop star Irene Grandi ( comparable to a cross between Madona and Britney Spears in the Englsih speaking world)) rocked the Paddock Stage at Misano from 10pm to nearly 1am to the delight of thousands of fans, many of whom knew all her songs and sang along. The paddock Village (below) was transfored into a brightly lit mioni city at night. 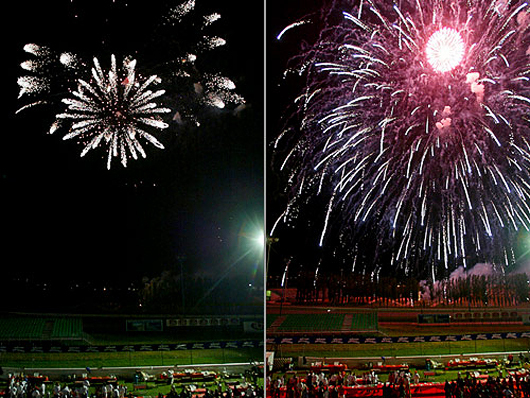 A record: 45,000 fans came to the Santamonica racetrack in Misano Adriatico over the course of the amazing weeklong event. A total of just over 19,000 passes were sold. The fourth edition of World Ducati Week has finally wrapped up, and like WDW’s past, it ended with a final raffle of a Ducati Superbike. 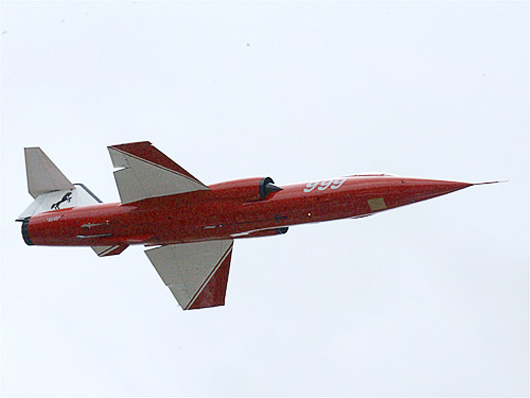 The lucky winner, Federica Fontana of Bologna, Italy, was called to the stage in front of thousands of fans to accept herprize of a flaming red Ducati 999. The most awesome moment of the final day, however, had to be the sight of thousands of Ducatis revving for the final bike parade along the beach roads of the Italian Riviera, where they were cheered on by masses of tourists and Italians who had come to soak up the sun. 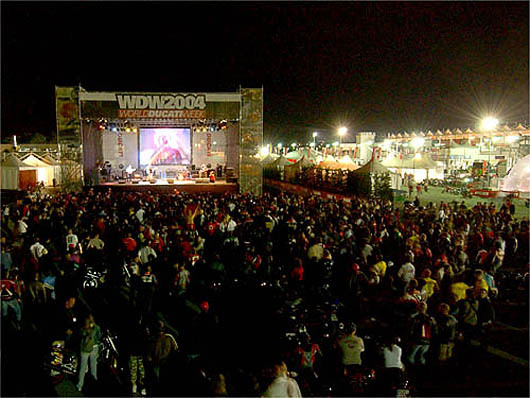 One of the new offerings for this year is the “I WAS THERE” project, which will allow WDW2004 participants to search through hundreds of Ducati archive photos of WDW (of themselves or spectacular moments caught on film) and will then be able to order the selected photo in T-shirt or poster form. You will find all the details on the Ducati.com website. Irene Grandi's biggest fans in the crowd were the girls who roacked and sang to all her sings for 3 hours!